The “Step Piece” unites four modular groupings from a center at the base. In this “vocabulary” a 3x3x3 unit is the “open” modular form which expands outwards from a center. 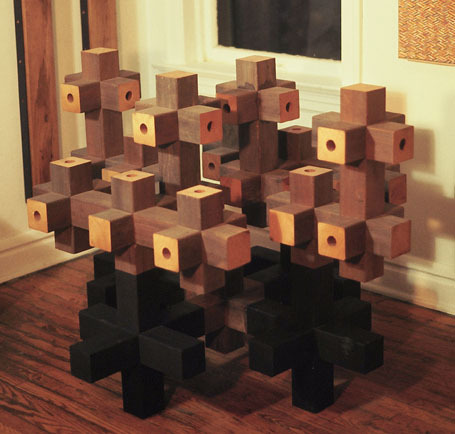 Other constructions explored the use of a “closed” modular form to contain and move inwards (see “The Mushroom Piece”). The four “feet” of this piece have been painted black to indicate they are of a larger modular size: 5x5x5. Because of their larger size, they are able to support the four vertical groupings without touching. Note the two vertical oak and steel “Progression Pieces” mounted on the wall behind the piece. The piece on the left is a Fibonacci Piece; the right an Arithmetic Piece. H: 48 in. x W: 8 ft. x D: 48 in.